Trout Lake Station has year round housing for 29 researchers with an additional 11 beds available in the summer. In addition, the Frost House has 8 beds and is available to UW-Madison Faculty conducting research in the environmental sciences. The TLS User Guide provides detailed information about staying on station. For summer reservations please complete the housing form. For reservations the rest of the year or for summer stays of 1 week or less please contact Pam Fashingbauer. Details and photos of the housing facilities are on our TLS Housing page. Cost for lodging is $10.00 per night per person. This fee is waived for UW-Madison researchers in the environmental sciences. Mattress pads are provided on all beds. Plan to bring your own pillow, sleeping bag/sheets, towels, headlamp or flashlight or both. All cabins have fully equipped kitchens (Stove, refrigerators, microwaves, coffee maker, pots, pans and dishes). Food is not provided on station. If you are arriving after hours contact Pam Fashingbauer prior to arrival to obtain access to housing. Please let Pam know when you are leaving the station. Do not leave food in the cabins: take with you, give to another resident or discard. Do not change bed assignments. There is no cleaning service provided, so each resident is responsible for cleaning his/her cabin. Garbage needs to be brought to the dumpsters near the main driveway. The closest grocery stores are located in Minocqua, St Germain or Boulder Junction. 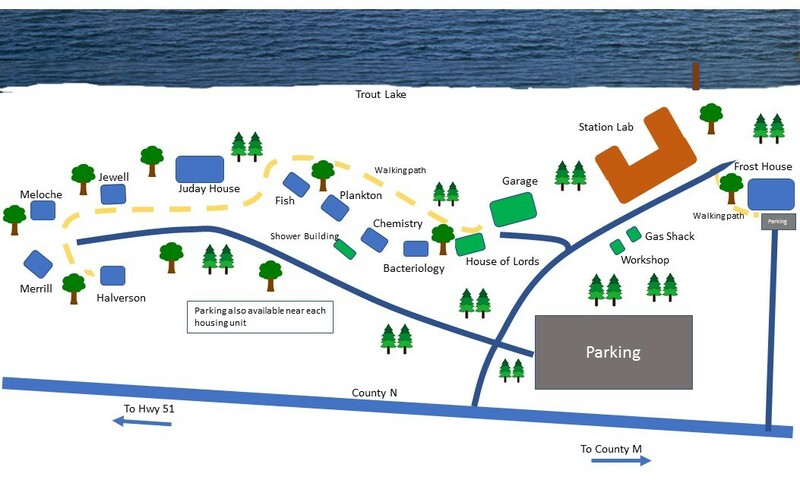 A swimming area and fire pit are located near the dock and are available at all times. A volleyball Court is located near Juday House. Laundry facilities are located in Juday house and the shower building. Pets are not allowed on station. The entire station has WiFi. 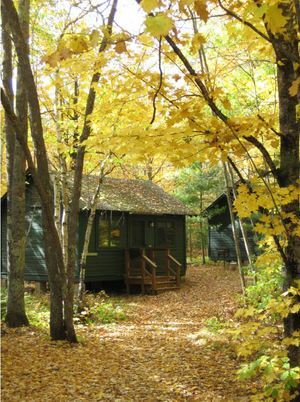 The year round cabins also have wired connections. The station building has wireless and wired connections throughout the building. General use computers are available in the main lab.